I grew up a mere fifteen minutes or so from Niagara Falls. I know Niagara Falls pretty well. Niagara Falls is no Iguazú. Oh, don't get me wrong, Niagara Falls is amazing, a stunning spectacle of nature that has to be seen to be believed. 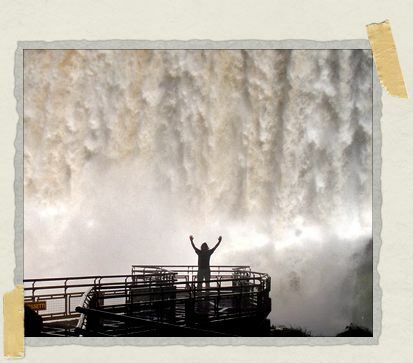 But I've seen it, and I'm here to tell you that it has nothing on the majesty of the mighty Iguazú Falls. Iguazú is one and a half times as high as Niagara. Iguazú is four times as wide as Niagara. Niagara is composed of 3 waterfalls. 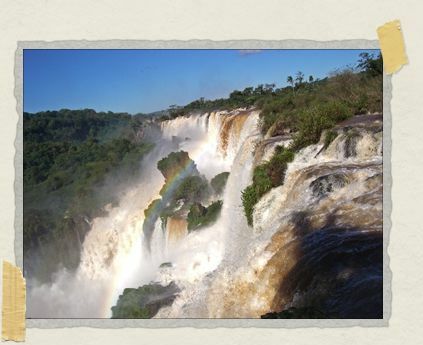 Iguazú is composed of 275 waterfalls. Niagara is surrounded by casinos, wax museums, and disreputable hotels. 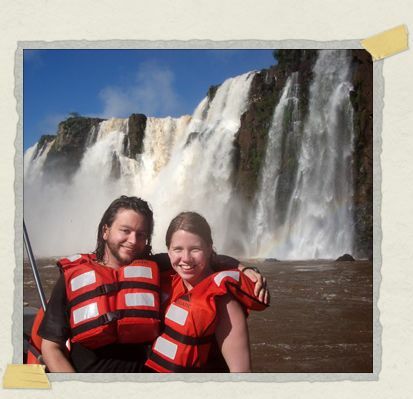 Iguazú is surrounded by rainforests filled with monkeys, jaguars, and ants the size of mice. There is no way to adequately convey how spectacularly beautiful Iguazú is. We took some lovely photos, but you'll just have to take my word that they don't even begin to do the place justice. Argentina, Paraguay, and Brazil all coincide at a place conveniently called Tres Fronteres ("three borders"). A few miles to the east of this point, along the Argentina-Brazil border, the river Iguazú abruptly plummets nearly 200 feet, in a series of spectacular cataratas, or waterfalls. 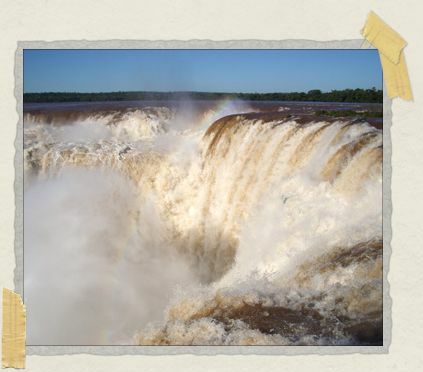 The falls are mostly along the Argentinian side, so the Brazillian side offers panoramic views of them in their entirety, while the Argentinian side allows you to see them up close. On both sides the falls are surrounded by enormous national parks. We spent two days exploring Argentina's Parque Nacional Iguazú. (Visa considerations kept us from checking it out from Brazil, but most people vastly prefer the Argentinian side anyway.) There are six primary attractions included with the park's 30 peso entry fee: the Paseo Superior, the Paseo Inferior, San Martin Island, the Garganta del Diablo, the Green Trail, and the Macuco Trail. In addition, there are several things you can do at additional cost, such as taking a 4x4 tour through the jungle or riding a boat into the waterfalls. The Paseo Superior ("upper circuit") was the first thing we did when we arrived at the park. After riding a train through the jungle for about ten minutes, you arrive at "Cataratas Station", where you can take a 1½-hour walk along catwalks suspended along the tops of several of the waterfalls. You are constantly surrounded by the roar of the falls, by tropical birds, and by the spectacular vistas offered by this seventh wonder of the world. Our next stop was to be the infamous Garganta del Diablo ("the devil's throat"). Another twenty minutes further into the jungle, the train dropped us off at at "Garganta Station". After walking along a kilometer of catwalks out over the river, we came face to face with the most spectacular, powerful thing I've ever seen. The Garganta del Diablo is a vast funnel of waterfalls, plummeting hundreds of feet into a murderous vortex, completely obscured at times by mountainous clouds of mist and spray. It was mesmerizing, and the roar of the water was deafening. Staring into the devil's throat was one of the most moving experiences I've ever had. We road the train back to Cataratas Station, and then got off there and walked back to the visitor's center along the Green Trail, a cobblestone path through the jungle. Signs at the beginning and end of the path warn that you may encounter wild animals (such as snakes, coatis, or even jaguars), but we were unsucessful in spotting anything other than some tropical birds. We did spot several toucans, though: they look so laughably like stuffed animals that it's difficult to believe your eyes when you see them. The park had another surprise for us that day. But that's a story unto itself, one Jessica plans to tell another day. The next day, we arrived at the park early, to avoid the throngs of guided tours that plagued us the day before. In fact, we were the very first people admitted to the park. We spent hours walking the length of the Paseo Inferior ("lower circuit"), a stunning collection of catwalks along the base of some of the waterfalls. Towards the end, there's something similar to what at Niagara is called the "Hurricane Deck": a platform suspended just in front of one of the waterfalls, pounded remorselessly with water. As we approached, we found a group of people standing a good fifty feet from the platform, taking pictures while safe from the drenching spray. We decided to be the first people to throw caution to the wind, and we took turns striding out to the edge of the platform, one of us getting soaked while the other took photographs. As we made our way back along the catwalk, two other couples (one our age, one much older) decided to do the same thing. Most of the other people either looked at us like we were crazy, or like they were envious of the experience we'd just had, but didn't plan on getting soaked themselves. We next passed the boat launch for the "Adventura Nautica", where the man at the podium did a good job of convincing us to buy tickets. We'd already been planning on taking the boat ride, but later in the day. He pointed out, though, that the boats were nearly empty now, but would be crowded later. "Also," he chuckled in heavily-accented English, "I don't want to be your father, but you should take it now because you're already wet. If you do it later, you'll have to dry off twice." The man was making a lot of sense, and so we bought the tickets. We had the boat almost to ourselves: it was just us, the driver, the guide, and one other couple. After taking us thrillingly close to several of the cascades, the boat was launched, as promised, directly into some of them. We were drenched from head to toe. It was wonderful. San Martin Island was closed that day, because recent rains had flooded out the beach and there was nowhere for the boats to land. The Macuco Trail we decided to leave for our next visit to Iguazu, because by noon on our second day we were exhausted by the nonstop adrenaline rushes the park had provided. All we wanted to do was to head back to our lovely hotel and relax by the pool. That's not exactly what happened, though. But that, too, is a story for another day. ahhh. you tease us! wow. incredible. i love the picture under the waterfall. what an incredible, powerful place. can't wait to hear more! Timmy the shot with you in front of the waterfall looks ah…its not ah…ah…"yeah your probably right"
Am I going to have to start a hedgehog fan club now? Props to both of you for being such brave pioneers on the Hurricane Deck!